很多人也會往內地公幹, 特別是香港回歸中國之後. 幾年前我也常在一兩天之內往返國內不同城市工作, 以一個不常出門的女子, 實在遇到不少問題. 但經過一段實戰之後, 也有少許心得想與你們分享. 1) 查明當地天氣, 因為中國城市日夜溫差很大, 有時可以相差10度, 絕對影響所需要準備的衣物. 2) 你所乘坐的航空公司決定你是否要先在上機前吃點東西. 經驗告訴我除港龍外(非中航 co-share freight), 如坐其他的航空公司, 還是預先吃一點點好. 特別如果你是一個愛咖啡的人. 3) 不要以為一個人坐在窗邊便不會被打擾, 其實坐在通道邊不但出入及進餐比較方便, 遇到旁邊的乘客有問題, 如嘔吐或鬧事, 閃避也容易一點. 4) 如坐國內航班, 請務必帶備濕紙巾, 薄荷膏, 口罩, 因為空調往往比較差. 5) 行李盡量輕便, 不用寄倉可避免遺失及漫長的等待時間, 特別往國內, 這種事情足以摧毀你整個行程, 切記! 6) 找換, 接送, 住宿等盡量在離境前安排妥當. 不要浪費時間在當地機場與當地人周旋; 除非你有大量時間, 金錢及冒險精神. 7) 如必要乘坐計程車, 不要把行李放在行李箱, 還是放在身邊坐位上好. 這樣不會被無良司機脅持行李講價. Many of you will need to have business trip in China, especially when Hong Kong was returned, I used to have this short trips rapidly in some years ago. As a lady not had much experience from the beginning, I gained some lessons after those "on site training"and would like to share some tips with you. 2) According to my experience, if you are not fly with Dragon airline (the non co-share flight with China Airline), but all others from Hong Kong, you better eat something you like before boarding; especially for those who need coffee. 3) If you are alone, take the seat near the aisle instead of next to window, it may be a lot more disturbance, but your great flexibility while going to washroom and dining, plus the emergency escape from trouble maker next to your seat are still worth. 4) If you need to take the domestic flight of China, make sure you've got disinfectant wet towel, mint ointment and mask in your pocket, because the poor ventilation without these handy tool may "kill" you in a second. 5) Hand carry luggage is the first rule, avoid disaster that happen always of luggage lost or keep on waiting at the delivery tracks till the last flight arrive to the airport. This will absolutely spoil your trip into a mess. 6) Try to arrange all your exchange of currency, local transfer and accommodation before boarding in your own country; don't bother to make those deal in the airport when arrive China with local guys, unless you have a lot of time, money and would like to be a great explorer. 7) If you really need to take local taxi, carry your luggage with you at the seat area and avoid putting into the storage at the back; then you will not have a chance for the bad guys to blackmail you for more fee by locking your luggage / document. 8) Take the usual driving path, never the short cut as suggested by the driver, even you are running out of time. 9) Remember or mark down the taxi no at once, and make sure the driver did activate the charge meter. 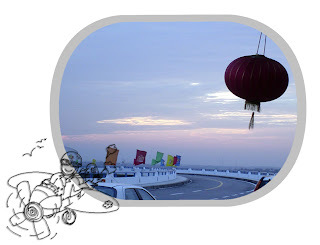 10) Don't sleep even if you are tired, try to remember the traffic route / time, especially to some landmark or road sign. It always help in case some driver wants to treat you by using a longer path to your destination. O.K.! just up to here, may share more next time if you feel these are useful. I am addicted to Facebook game after I discovered there is no point to continue invite or connect real friends, who you've actually will keep contact in your daily life. So I just concentrate to a game call "Restaurant City". This is a game for operating a virtual restaurant or cafe, you can have bigger shop area with more staff by operating day after day to gain your virtual coins and level up. You will have to pay your staff by feeding them after working each 4 hours, you have to buy or exchange ingredients to cook your dishes; and the most attractive part is...you can shop and buy to decorate. I am not surprise of how this game attracts so many people to play, that can fulfill their shopping wishes and cafe dream. Basically you will never lose and have no pressure to run this business, even if you do nothing and just online every day 24hours, you will gain your shop area and level up. In case you forget to feed your staff, they "died" but can "live" again whenever you feed them. So there is absolutely a risk free business. Will any of player gain an experience to open a cafe in the real world? I just wonder! I won't play full day, as I do need to take a break from the virtual world and back to reality to face my real risk; but if you ask what do I gain? I can tell besides of layout practice and the pleasure, it will be patience and self control...I am sure you know what I mean. Monday is always the most busy day of the week. I am a rush lady, when there are some tasks stuck up in my brain, I will get rush and want to finish them all at once. This is killing me, because my blood pressure will rise immediately follow with a quick heart beat, then I have to sit down and figure out what is really urgent that should come first in my schedule before I "died". I have this bad habit since I had my career. The good side is I usually finish my task earlier than it should = rarely miss the deadline, which is very important to me as in the design field; but the truth is, actually I have enough time to finish one by one, rather then complete some of them simultaneously to increase my work load. Worst of all, this bad habit affects my daily life,too. Say each Monday when I am back to my office, I will want to turn on all lights, copier, printer, air conditioner, server, computer, wash cups, boil water, charge mobile, check email, reading blogs, write blog, flip today's calendar, water the plants......all at once. I know it is insane and no need, but, I do have this feeling to push me through; now, I will take a break after turn on the light, take a big breath, act one after the other. Although I have to force myself of having a more controllable work path, I do think this is a must, to learn acting one thing after the other. To gain a bit more time of thinking, a chance of changing to the matter which seems no hope; like standing in front of a soft drink vending machine, all sorts of drinks are there, even if you want more than one, you still need to purchase one by one. You may want to select another taste when the one just comes out from the machine, so why hurry to have two or three at the same time? Hello all, you may find that I've add a widget of Amazon.com at my side bar this week. Well, one reason is hopefully to gain some coins by recommendation, but truly this is only a dream, I guess. The actual reason is add another channel for sharing. I've read some blogger's blog who can write good articles to share what they've read, I suppose some of them they are writers. I don't have this ability, but I still want to share with you all when I come across some really good films, books or music, that touch my heart; so I finally choose using Amazon as a channel. Wish you can enjoy it, too. Good day! I have just returned from busy days, worked for an ah hoc project from last Saturday until yesterday. This morning, besides of having my real breakfast, I take a break to enjoy my virtual breakfast, too. It's always enjoyable to read blogs, especially for those I've followed, it seems we are connected through sharing of post. I usually started from a quick view in Google reader, then a detail read in specific post, if time allow, I will go to "The Coffee Shop" see what's happening around people, looking for some more new blogs to read. Is this your daily pattern, too? I will miss if I can't have two "breakfast" each day, thank God this will not cost more or increase my weight, but only brings me more joy.